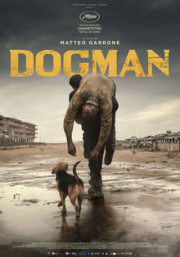 Review of “Dogman” a Film by Matteo Garrone. Jane McChrystal. Credits: Screenplay: Ugo Chiti, Matteo Garrone, Massimo Gaudioso. “Dogman” has scenes of tragedy and violence which are unforgettable and, at times, unbearable to watch. Its location, a decaying seaside resort on the coast of Campania, forms a backdrop of such extreme desolation that I only hope it is the product of the cinematographer’s art rather than somewhere people are actually expected to live. Garrone has used two non-professional actors, Marcello Fonte and Edoardo Pesce – to play out the relationship between Dogman Marcello, owner of a dog grooming parlour, and Simoncino, the local tough. Marcello is a tiny man for whom the word “goofy” might have been coined. He washes, combs and trims his clients with tender care and appears a loving father to his ten year old daughter Alida, but something is wrong. Marcello deals in cocaine on the side and his best customer, Simoncino, a tightly wound mass of meat, sinew and muscle, has an addiction which is growing dangerously out of control and there is nothing Marcello will not do for him. When the men of the town take out a contract on Simoncino, Marcello saves his life. Marcello is chihuahua to Simoncino’s bull mastiff, who beats him up and humiliates him at every opportunity. He serves a year’s prison sentence for a crime Simoncino has committed and never even gets the measly 10,000 Euros he was promised for the sacrifice. He loses everything, including the respect and affection of his neighbours, and is reduced to sleeping in the space where he temporarily lodges the dogs which are now his only source of income. It is a bewildering experience for the audience – Why does Marcello abase himself for this being who seems scarcely human? Can Simoncino do anything ever to push Marcello over the edge? There is no backstory and little in the way of psychologising to help them out. The script, its dialogue full of brutal profanity, doesn’t really shed any light on their dynamic. Well, in the end Marcello does find his breaking point and during the final scenes, as the camera lingers on his tragic, battered face, he gazes impassively the destruction he has finally unleashed around him. Don’t miss the film of this elemental tale. It is possibly Garrone’s best work so far.